This article provides a practical explanation of the Logical Levels of George Bateson & Robert Dilts. After reading, you’ll understand the basics of this powerful communication tool. The term Logical Levels refers to the theory that some processes, events, and other phenomena are created through their relationships with other processes, events, and phenomena. The Logical Levels are represented as a hierarchy. Gregory Bateson formulated the concept of Logical Levels of learning as a mechanism in the behavioural sciences, based on the studies by Bertrand Russel. Bateson identified four basic levels of learning and changing, after which Robert Dilts supplemented this up to six: identity, values and standards, possibilities, behaviour, and environment. The sixth level, spiritual, is defined as a relational field because it contains multiple identities that can make the individual feel like he’s part of a large system that goes beyond someone’s individual identity. Robert Dilts discovered that learning at the higher levels of the hierarchy utilises more brain capacity than learning on lower levels. Working and learning at the higher Logical Levels is more complex and challenging than working and learning on the lower Logical Levels. This is shown in the work of a coach or psychologist, for instance. The tension will often rise when the focus in the conversation moves from a low level, for instance environment and behaviour, to a higher Logical Level, such as identity and convictions. Robert Dilts is an author, consultant, trainer and developer in the field of Neuro-Linguistic Programming (NLP). NLP is a model about human behaviour, learning, and communication. The basic idea behind the Logical Levels is that each level has a direct relation to the lower level in the hierarchy. A change on a lower level doesn’t necessarily change the levels above. A change on a high level, however, always changes the lower levels. An example: when the identity of a person changes, it’s an absolute given that this will affect his or her behaviour. On the other hand, if a person’s environment changes, his or her convictions and identity might stay the same, but they might also change. The environment refers to the external circumstances in which behaviours are expressed and in which humans are active. It’s particularly about the time and the geographical location where change has been established. A person who acts from this level will probably explain the change by stating exactly what happened and who was involved. This explanation can be accompanied by complaining. Behaviour is about what people do and say. If an onlooker were to observe another person, the behaviours are what the onlooker would see, feel, or hear when the observed person is carrying out an activity. Behaviour refers to action and reaction of a person in a particular environment. On this level, a person describes what he thought, did and what effect this action had in a certain situation. Skills refer to the possibilities, competencies, qualities, and strategies that people can apply to engage in or initiate change. These could be technical competencies in their field, but could also refer to ‘soft skills’ such as the ability to adapt to the new, changing situation. This is considered as the ‘how’ level. Competencies and skills guide behaviour through a personal strategy. Convictions, values, and standards support a person’s higher sense of identity. This level is about the ‘why’. Belief and convictions concern the reasons behind certain behaviour. According to the Logical Levels, belief and convictions can reinforce or undermine capacities and skills. If a person is convinced he’s bad at drawing, this could undermine attempts to learn how to draw. Convictions are about whether someone believes that something is possible, whether something is necessary or unnecessary, or whether motivation is stimulated. Identity is about the question: ‘who are we?’. This enables people who are going through change to forge a shared identity. Conversations on this level are often regarding personal subjects. What do I like? What drives me? What’s my passion? The Logical Levels describe the identity level as the sense of self-worth; the self-realisation a person identifies with. Identifying with something or someone can be done in many different ways: a job, marriage, religion, etc. This level from the Logical Levels theory is about the deeper-rooted question: ‘what else are we here for?’ This level can also be called spirituality, referring to the larger system we might be a part of. This can give rise to many fundamental questions, particularly in young people. This part isn’t always included in the Logical Levels because it goes beyond the individual. Some will use the term ‘wisdom’ to label this level, others exclude it completely. The essence of this level is that it uses people’s motivation to support change. We use an example to support the Logical Levels theory. Let’s say that Jeremy often has problems at work. It’s not the first time, and once again Jeremy decides to switch employers. He makes the rash decision to leave his environment, the first Logical Level. At his next employer, however, Jeremy soon finds himself in the same situation. Yet this time, he starts to wonder whether there’s something he can change in his behaviour, the second level. Perhaps he should change his behaviour towards others, as he keeps ending up in the same situation. If Jeremy doesn’t know how to prevent such situations, perhaps he should learn a new skill on the third level. A better way to handle conflicts, perhaps a more assertive communication style. That’s not easy, though. Change on higher levels is always requires more effort, as fundamental matters must change. Jeremy should lose the conviction that how he behaves might not be the best way. When these convictions cohere with his identity, he might have to think about who he is to arrive at a long-term solution. If he can’t make that work, change at such a level is difficult, and he should consider what else is more important to him than he himself is. Spirituality or a mission or goal in his life can make him realise what’s wrong and how he can change the situation by changing. Developing skills in using the Logical Levels adds diverse interpersonal qualities. It adds precision and depth to both the communication style and the understanding of other people. 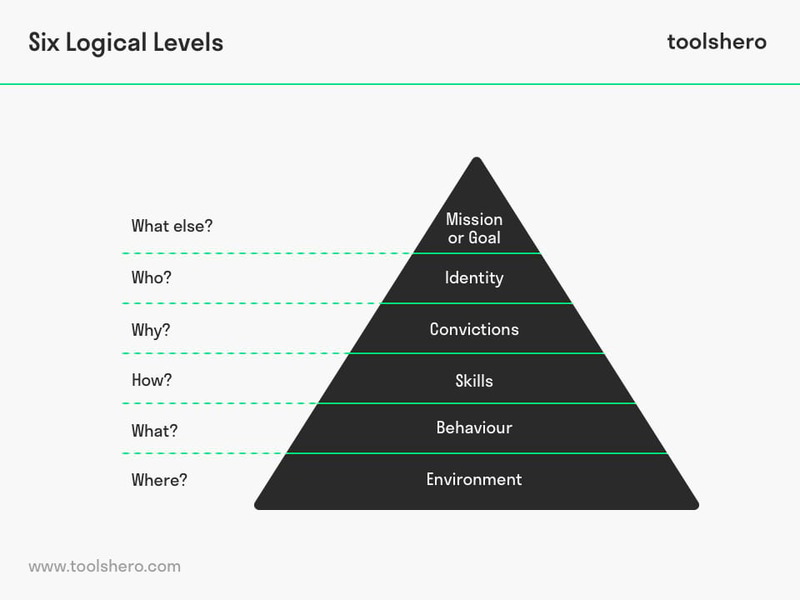 The Logical Levels theory provides the user with a structured way to understand what’s happening in a system like human personality, a partnership or other relationship, a team, department, or even an entire organisation. At what level a certain person functions can be identified by the language they use. When a person continues to work at a single level, a problem or situation could easily appear to be unsolvable. However, if the level changes, the problem also changes and is suddenly viewed from different perspectives. By changing the language and lifting it to a higher level, the problem will change and a new perspective will present itself. What do you think? Do you recognise the explanation of the Six Logical Levels? What do you believe are factors that hinder the progress from a certain level to the next? How do you think the Logical Levels can be applied in practice? 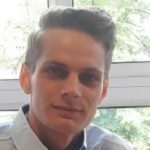 Do you have any tips or additional comments? Sullivan, W., Sullivan, R., & Buffton, B. (2001). Aligning individual and organisational values to support change. Journal of Change Management, 2(3), 247-254. Tosey, P., & Mathison, J. (2003). Neuro-linguistic programming and learning theory: A response. The Curriculum Journal, 14(3), 371-388.